What did Lewis and Clark believe about heaven? It is perhaps telling that in the entirety of the journals, despite the jaw-dropping beauty of many of the places they passed through, the word “heaven” was never once invoked by either Lewis or Clark. 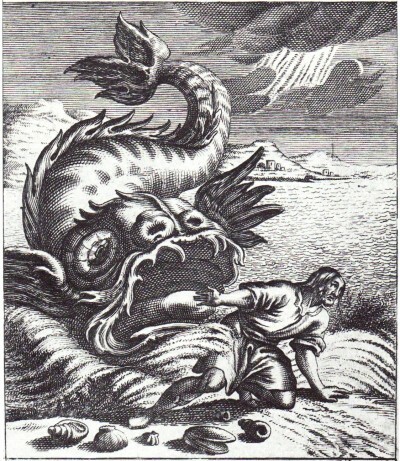 The closest they came to referring to any kind of afterlife was in Lewis’s 31st birthday note of August 18, 1805, when he mentioned that “I had in all human probability now existed about half the period which I am to remain in this Sublunary world” – implying that he believed there might be a world apart from this earthbound one. Like most educated men of the enlightenment, Lewis and Clark were deists. 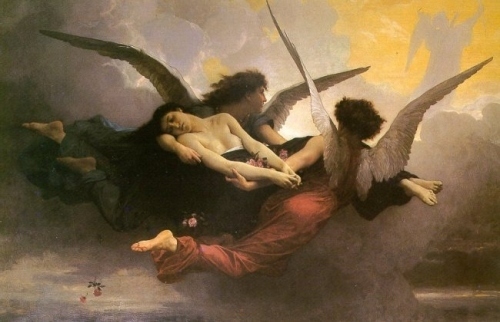 The deist image of heaven in the late 18th and early 19th century was of a very beautiful place, far away and separated from this cruel and dark world. Full of clouds, angels and harps, it was a place where a virtuous man might, after death, enjoy reward, respite, and reprieve from the toils and pains of physical life. For all its beauty, the deist heaven was somewhat impersonal. The individuality and identity of the soul on earth was no longer of much importance once you reached the celestial plane. In his first message to Congress in 1801, Jefferson optimistically thanked the “beneficent Being” who had instilled in the contentious political parties a “spirit of conciliation and forgiveness.” In his second message, he attributed the nation’s economic prosperity, peace abroad and even good relations with the Indians to the “smiles of Providence.” Sounding the same theme in his second inaugural address, Jefferson said that to avoid making the mistakes which he, as a human, was prone, “I shall need, too, the favor of that Being in whose hands we are, who led our fathers, as Israel of old, from their native land and planted them in a country flowing with all the necessaries and comforts of life.” Jefferson might have been a man of Reason, but clearly God –if not organized religion – had a strong presence in his life and thinking. Set out this morning at an early hour, the courant strong; and river very crooked; the banks are falling in very fast; I sometimes wonder that some of our canoes or perogues are not swallowed up by means of these immence masses of earth which are eternally precipitating themselves into the river; we have had many hair breadth escapes from them but providence seems so to have ordered it that we have as yet sustained no loss in consequence of them. In the aftermath of the awful, grisly cataclysm of the Civil War, a young woman named Elizabeth Stuart Phelps penned a novel called The Gates Ajar. Phelps had lost her lover in the war. Overwhelmed not only by her own grief but by the enormity of the tragedy suffered by all who had lost husbands, fathers, sons and brothers, she decided to write a book that offered comfort to the bereaved and suggested they would see the beloved dead once again. The view of heaven presented in The Gates Ajar was a perfect recreation of Victorian domesticity, where families are reunited with their loved ones, live in houses, walk the streets of heaven, and spend eternity in perfect harmony. Broken bodies are restored to health, and earthly toil and fear of death are banished forever in the light of heavenly happiness. Phelps does not explicitly say that all our old pets will run out to greet us, but she comes close. 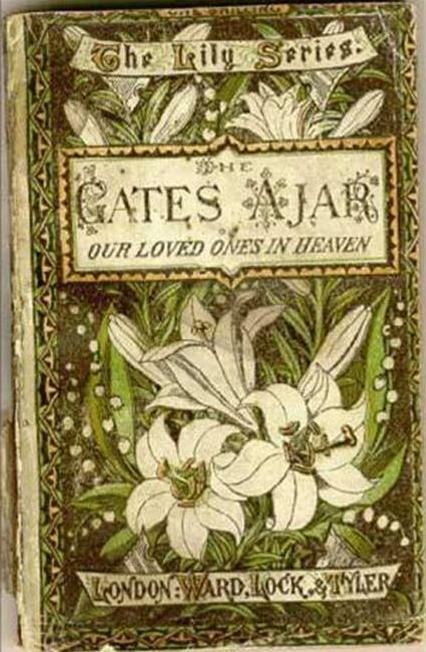 Released in 1868 and reprinted 55 times, The Gates Ajar was one of the best-selling books of the 19th century, second only to Uncle Tom’s Cabin. This one book shaped, much more than we realize, notions of heaven that we cherish to this day. Lewis & Clark: Did They Pray? Thanks for your marvelous post! Regardless of one’s religious philosophy, and not to ignite a huge discussion, if one assumes that strong reliance on deity is frequently based on fear of managing one’s present, it’s astounding to me that Lewis and Clark, facing tremendous peril, were so casual about fateful events. Moreover, when compared to the heavy presence of deity-based sentiment today, one wonders what perils lurk in the minds of many Americans that are comparable to the captains’ (and their mens’) sound fears of death, starvation and the unknown. As an aside, IMO, Jefferson would be a greater heretic today than he was in the 19th century! Great comment Michael! In personality, Lewis & Clark seem to have had the personalities of modern-day astronauts. (Famously, John Glenn’s heartbeat did not go up when informed his space capsule might burn up when he reentered the atmosphere.) As Tom Wolfe put it in “The Right Stuff”: the uncritical willingness to face danger. I loved your point about the anxieties of the modern age. Again not to cause offense of anyone, but I find the frantic anxiety of some present-day evangelicals to be frankly laughable. (Gay entertainers! Panic in the streets!). Lewis & Clark seemed to have no need to feel they were written into God’s drama to be motivated or find courage. With his religious views or lack thereof, Jefferson could never be elected today. Food for thought. The extent to which any of the Founders considered themselves to be “deists” has been greatly exaggerated by Anti-Christian historians. Jefferson, being the best example as they nearly always call him a “deist”. Period. Exclamation point! The truth being far more complex and nearly the opposite of that. The truth is that Jefferson only briefly flirted with deism and many of the other Founders, like John Jay, were devoutly Christian and soundly rejected deism. Case in point, being the “wall of separation”. Today’s Anti-Christian ranters claim that Jefferson, the “deist” had the same views on it that they do. Jefferson issued a copy of the New Testament to all Freshman at the Government-Supported University of Virginia and TESTED them on it. Would a deist do that? Or someone who has today’s view of the “wall of separation”? 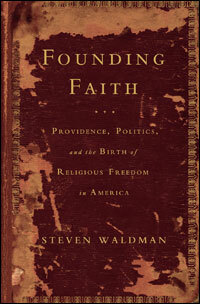 During Jefferson’s Presidency, many Counties, and Towns had an official Government Supported CHURCH. Many more Governmental Entities below the level of The Federal Government proclaimed Christianity to be their official Religion or Guiding Force. Would a deist who believed in today’s “wall of separation” allow that? The truth is that Jefferson and most of the other Founders didn’t want a specific CHURCH to have perks and priviledges not available to other Christian Churches at the FEDERAL Level. As was the case with the Church-Of-England in Great Britain. Baptists, for example, couldn’t even be in the Parliament. THAT was their view of what the “wall of separation” meant as a matter of practical governance. Their actions and words indicate that most had little problem with Governmental endorsement of Christianity below the level of the Federal Government. They would LAUGH if someone suggested that the “wall of separation” prevented a Public High School Football Coach from saying a prayer for the players before a game. And they’d consider it a horrible waste of tax dollars to tear down Crosses from City halls and such. Methinks you take offense with the possibility that practicing deists were VIPs in our history; well, they were. Do you know the history and widespread influence of deism at the time? Why is it some Christians today are so bothered with the suggestion that Christianity was not the end-all of every founding father? I suppose there are anti-Christian “ranters” (to use your term), but of course they’re balanced out by Christian ranters. Ms. Hunter’s blog is about American heroes, not a debate on religion in the colonies. While I didn’t agree with some of the details of Troll’s post, the point is well-taken that we cannot and shouldn’t attribute 20th or 21st century thoughts and ideas to people from the past. This is an interesting point and well worth making, and I think on-topic for the subject matter of the post. Debate is fine on these pages, but I will shut down anything that strays out of the polite, courteous, and reasoned. Leave name-calling and contemporary politics out of it and nobody gets “poofed.” Thanks.